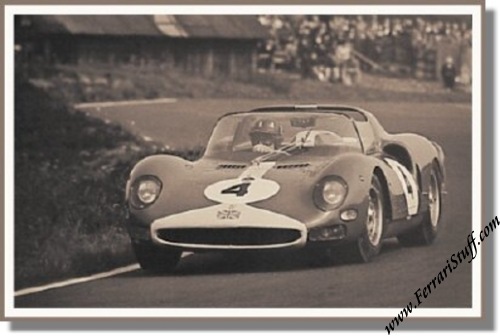 Graham Hill, Ferrari 275 P2 Nurburgring 1000 KM 1965 Poster. A truely great poster of Graham Hill at the wheel of the Maranello Concessionaires Ferrari 275 P2 S/N 0826, now residing with Ralph Lauren, during the 1965 1000 KM Rennen at the Nurburgring. Graham was partnered with Jackie Stewart for the race but they would retire due to electrical problems. Photography by Rainer W. Schlegelmilch. This poster will be shipped in a sturdy tube.